Sitting at home after an usually busy Tuesday night shift, I’ve got a few things on my mind. Firstly, does it really get hotter than this during a DC summer? Secondly, how many hours can I sleep tonight seeing as I have to be back at the shop to open in the morning? And thirdly, man oh man, thank goodness Ben was working with me tonight and gallantly handled the hoards of customers (while I diligently did dishes in the back). For months, Ben has been my typical closing partner on Tuesdays, and even though he’s now spending most of his week outside of the cafe (running farmer’s markets, catering weddings and coordinating events), luckily for me his Tuesday night shift remains. As a man who is always gracious when a customer compliments his t-shirt, happy to engage in an existential conversation about happiness, and ready to cue up some Paul Simon, I’m thrilled this week to share some insight into Ben, the Pleasant Pops Catering and Farmers’ Markets Manager. What’s the funniest thing you’ve been asked about a pop? People understandably love peanut butter, and they want to know if humans can eat the Puppy Pops. So many people wanted to know that, and at some point, I felt duty-bound in my role as Catering and Farmers' Markets Manager to eat one, in the name of science, so I could report back. I always tell people, "It tastes exactly how you think frozen peanut butter and water would taste." What’s the most common question you get asked at a market? "Do you make these?" Maybe they see me and they're nervous about what I might come up with. 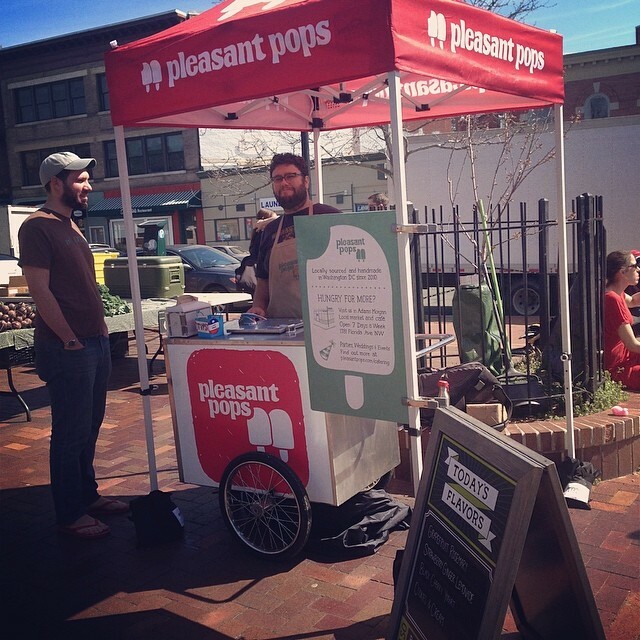 So, I assure them that, while the Pleasant Pops crack team of Poptimizers makes all our pops at the Mothership in AdMo, I (mostly) just sell them. I may stray, especially when a great flavor (like Blueberry Pancake right now) comes back, but my heart, and stomach, always returns to the Vegan Mexican Chocolate. What’s the coolest thing you’ve ever seen while catering an event? A bluegrass band at a wedding, with a line of people dancing behind them. What’s the hardest thing about driving the Pop truck? Getting it rolling in the right direction on the highway so I can leave the wheel, walk back to the cooler, and get another pop. What do you listen to on the radio when you’re driving to an event? Classic rock. For some reason, Come Sail Away by Styx always plays right when I need it to. We know you’re a man of great t-shirts. Which t-shirt is your favorite, and why? Favorite pop, favorite t-shirt. What's next, favorite child? Toss me a few softballs here. Okay. My favorite tee is black with a colorful rendering of Times Square and a child's silhouette in the foreground. It's evocative, it looks cool, and I get a lot of compliments when I wear it. Plus, I've had it for a little while, so it has a nice, soft, lived-in feel to it. What’s the most common pop requested for catering events? Cookies and Cream gets requested a lot, I think because people know that flavor even if they don't know our pops. So it's a pretty safe choice. But honestly, most people don't request specific flavors, which is okay, because then I bring the ones I like (so I can eat a few) and the ones I like are the best. There's a kid at Mt. Pleasant who always wants to work for me, although he assures me he doesn't expect to get paid. I've tried to set him up to do some work, which would be nice, because I always like a chance to take a break. But he's a little too short to reach the pops inside the cart. Still, when I did get him going (with some assistance), he started getting tips left and right. I let him keep what he earned. I'm a firm boss, but I'm also fair. Thanks Ben! Make sure you visit Ben at the White House Farmers’ Market on Thursdays from 11 am- 2:30 pm and at the Mount Pleasant Farmers’ Market on Saturdays from 9 am- 1 pm. And, of course, most Tuesday nights at the cafe with me!